Sekou Coker Bangoura is one of those players I've watched picking up trophies for years. 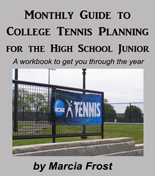 He's grown quite a bit during those years, but there wasn't a moment when his tennis wasn't consistent. He has had what it takes to keep him in the top five in the 12s, 14s and 16s. Floridian Sekou is currently ranked No. 4 in the 16s and No. 34 in the 18s as he makes his way into the older age with ease. He has already won one (Plaza Cup) national title in that age group and placed at seven other events -- before and after sweeping the 16s at the USTA National Winter Championships. The National Winter is an event Sekou knows well as he also took 4th place doubles there in January of 2007 (with Nelson Vick) and 3rd place singles in the 14s during 2006. After each feat he stuck around Arizona a bit, winning the singles and doubles at the Copper Bowl in '06 and making doubles semifinals and singles 4th Place in '07. Sixteen year old Sekou Coker Bangoura is not only comfortable on the doubles court as well as the singles, but he's proven himself as an all-court player with equal wins on clay and hard surfaces. In addition to his recent sweep of the National Winter Championships, Sekou has taken home USTA balls from the 2007 USTA National Hardcourts (3rd place doubles, with Nelson Vick); 2006 USTA National Claycourts (2nd place singles); and 2006 USTA National Winter Championships (3rd Place singles). He has also earned seventeen National Open trophies. 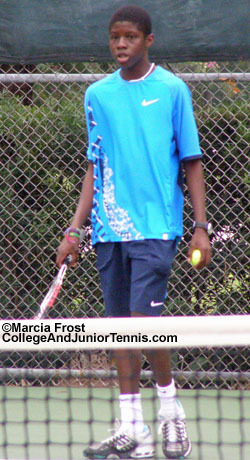 I sat down with Sekou Coker Bangoura at the USTA National Spring Championships in Alabama. It wasn't one of his best tournaments (he lost in the first round before winning three rounds of consolation), but he was still his smiling self.